Let's take a few minutes to discuss the pecan leaf. 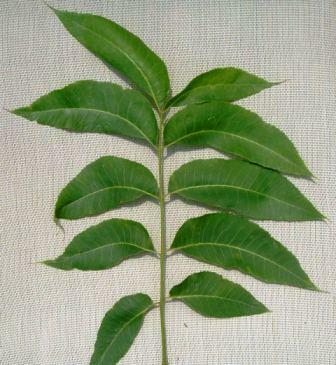 These leaves are composed of around a dozen or more leaflets. Overall the leaf may be 12 to 18 inches long while each leaflet will be sickle-shaped (hooked), 4-7 inches long and 1-3 inches wide. The leaflets are alternate (opposite one another on each side of the center stem) in arrangement. The leaf, composed of these leaflets, is pinnate or feather-like in appearance. Also of note, is the edges of the leaflets. They are jagged or toothed around their edges. This description should help you to determine whether or not you have a pecan tree in your yard. 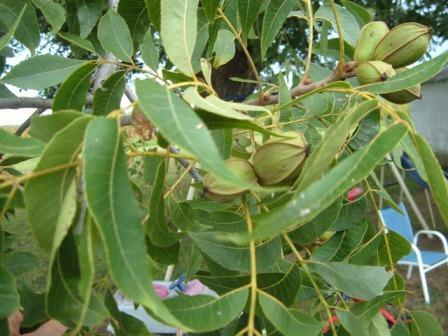 If you see pecans on the tree that will be a sure give-away that it is a pecan tree! 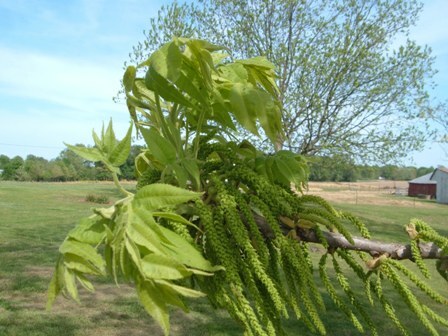 Below is a picture of a branch of a pecan tree in the spring. Notice the leaves and the "tassels" which flower and pollinate in the spring. So you have a pecan tree, can you do anything with the leaves when they fall? Sure, use them as mulch or organic filler in your garden and flower beds. Wait!! You may have heard that they would kill your plants or make your soil too acidic. Neither are really true. This thought may have come from a close cousin of the pecan tree, the walnut tree. 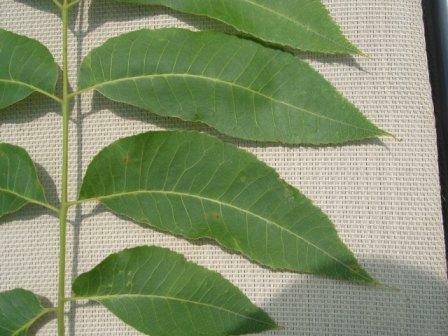 Walnut leaves have a substance in them that may harm tomato plants. The pecan leaves may be slightly acidic, especially if the soil the tree grows in and that which the leaf mulch will be applied to, is acidic. But it likely won't be enough to make any differences. So go ahead and use your pecan leaves as a soil additive and mulch. It is probably a good idea to allow the leaves to dry and slightly decompose. This will help in breaking down the leaves into a better organic material. I usually rake them up, and then spread them out over the garden in the winter. Come spring they just get worked into the soil, what is left of them. Don't forget, pecan shells can be used as mulch too! 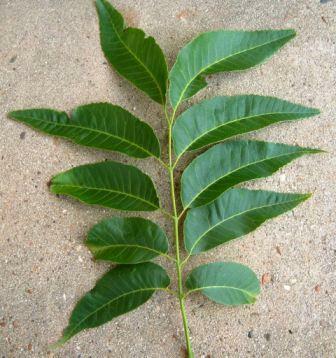 Below is a nice photo of pecans leaves with late summer pecans.